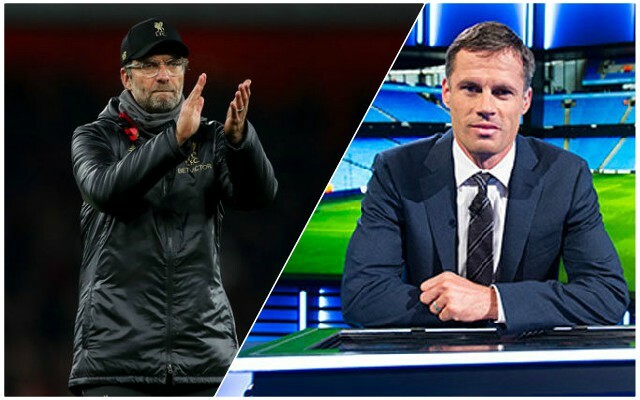 Jamie Carragher says it is too soon to judge whether Liverpool’s draw at Old Trafford was one point gained or two dropped – pointing out that results later this week will decide that. The Reds host Watford on Wednesday evening, before the trip across Stanley Park to Goodison next Sunday. Win both of those, Carragher argued, and the Old Trafford frustration can be viewed in a very different light. He said post-match: “With Liverpool, I think we keep building this game up, and they should have gone and won it, but it’s the week. “If Liverpool get out of the end of this week, and they’re still top of the league—whether it’s a point [or more]—it’s a good week. Jurgen Klopp was understandably frustrated immediately after the match, as were most Reds supporters, but equally, had we been offered a point at the start of the game, most would have taken it. Mo Salah and Sadio Mane will need to step up and be more clinical in the coming games, but there is no reason why six points cannot be gained in the next seven days. Do that, and we’d be in a really strong position with each game passing by a game closer to the finish line.